Start in a lunge position with your right leg forward and your left leg back (knee off the floor), fingertips on the floor. Begin to shift more weight onto your front foot and fingertips, and on an inhale, float your back leg up for a modified warrior III, fingertips on the floor (or on blocks) in front of you, and your left leg lifted behind you, hips level with the floor. Keep your back heel at hip-level (but not higher than hip-level, which tends to strain the lower back). Lengthen through your spine, and align the back of your head with the back of your pelvis. Bring your right hand to your hip to begin. Lift your back inner thigh up. Ground through the mound of your right big toe and your right outer heel, and move your right outer hip back (bending the front knee can help). Inhale, lengthen your spine, and on an exhale, initiate the twist from the back of your left rib cage. Keep the twist primarily in your middle back, and keep your back heel at hip-height (it will want to drop). If your shoulders are completely stacked, then you can lift your top arm straight up. Otherwise, keep working the twist with your hand on your hip. Keep the back of your head and the back of your pelvis aligned and look straight ahead, or turn your head to look up if that feels comfortable for your neck. 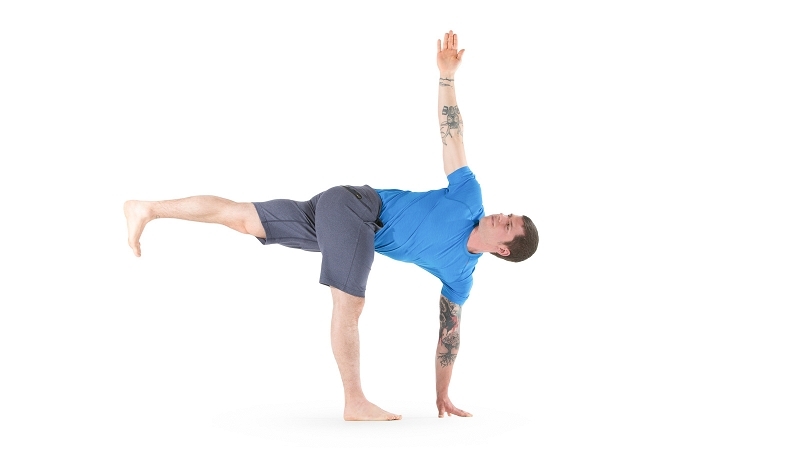 For more stability, practice the pose with your back foot pressing into a wall behind you.